Is Depression Contributing to Pain. Pain in the arms, legs and back. Fatigue and sleep­lessness. 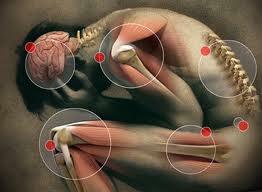 Problems associated with arthritis and related conditions, right? Yes, but they’re also the physical signs associated with depression, so figuring out the root cause means you can get proper treatment. Arthritis-like physical symptoms among others [see below] may im­p­rove if the depression is treated with medication, according to research published in the Journal of General Internal Medicine. Why patients with depression may experience joint and muscle pain is not yet fully understood, says Matthew Bunyard, MD, senior staff physician in The Cleve­land Clinic’s department of rheumatic and im­mu­nologic diseases. “One theory is that the pain path­­ways going through the spinal cord and brain somehow get de­ranged, and patients with depression experience musculoskeletal pain even though they don’t have arthritis,” says Dr. Bunyard. Whatever the theory, doctors may not realize that a patient’s physical symptoms are linked with depression, according to another study published in the Journal of General Internal Medicine. Consequently, patients may not receive appropriate treatment, such as antidepressants or psychotherapy. To ensure good care, doctors need to complete a thorough health history and physical examination to distinguish whether depression or another ailment is the cause of the physical symptoms, says Dr. Bunyard. Rheumatologists need to consider that some patients may be suffering from both depression and arthritis. The chronic arthritis may be contributing to the patient’s depression, or the depression could be aggravating the pain from arthritis – a chicken-and-egg predicament. Whether the chicken or the egg comes first, communication between the doctor and patient is key to ensuring the best possible care, says Dr. Bunyard, who suggests that patients keep a written account of what their pain feels like, writing down a description of whether the pain is numb, sharp or dull; where it’s located; what makes it better or worse; and how long it lasts. Bringing the journal to the doctor’s office will help the doctor prescribe any necessary treatment. In the case of musculoskeletal pain, a visit should occur if symptoms are persistent or interfere with daily activities.